The Aster, in some of its varied forms, is found in all countries, over two hundred and fifty species being known to botanists. Although the plant is cosmopolitan, it is essentially an American form, one hundred and fifty of the total known species belonging to North America. Of the balance, Russia claims twenty, Europe ten, and Canada sixty or seventy. It seems as though Nature, after the first blush of spring, relaxed her efforts for a supreme endeavor towards the close of the floral season. Then she assumes her festal robes and the woodlands and fields become gorgeous with the purple of the asters, the gold of the sunflowers and goldenrod, with here and there the cardinal and blue of the lobelias. Among all this symphony of color, no plant is more lavish of its charms than the New England Aster. Botanically considered, the asters belong to the Compositae, a family of plants including from ten to twelve thousand species, and characterized by large numbers of flowers crowded together into single heads, each of which gives the impression of a single flower. What appear to be petals are known as ray flowers, and give the characteristic color, as the purple, blue, or white of the aster or the yellow of the sunflower. These rays consist of flowers whose petals have been joined together and spread out flat, the points of the petals usually appearing on the end of the ray. In the case of the asters, the ray flowers, which occur in a single row, are pistillate or have a pistil and no stamens, and hence are capable of producing seeds. The center or disk flowers are tubular, yellow in color and perfect, containing both stamens and pistils. The heads are surrounded by an involucre, having leaflike tips, and are variously massed or branched along the stems of the plant. With few exceptions, the asters are perennial, coming up each year from the old underground portions and flowering in autumn. 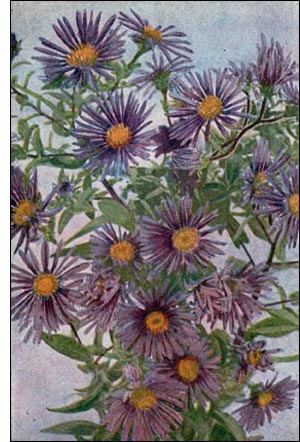 They vary in height from a few inches to eight feet or more, but in the case of the New England Aster, the completed growth is generally from two to seven or eight feet.